Horst Berger is a structural engineer and designer known internationally for his work in the development, design, and engineering of lightweight tensile structures. More than 40 of his projects in this new architectural technology have been built over the last twenty years. They include landmark structures such as the San Diego Convention Center, Canada Harbour Place in Vancouver, and the Landside Terminal enclosure structure of the new Denver International Airport. They also include the Haj Terminal at the Jeddah Airport, the world's largest roof structure, and the roof structure for the King Fahd International Stadium in Rijadh with its record spans. His designs of fabric structures for civil engineering purposes include cooling towers and coal and grain storage covers. Mr. Berger started his career in 1955 in the Bridge and Special Structures Department of Wayss and Freitag in Frankfurt, Germany, designing concrete bridges, shells, and domes. From 1958 to 1960 he headed the structural department of a large A/E office (F.H.Kocks) in Iran. In 1960 he joined Severud Associates in New York city. There he participated in the design of the St. Louis Arch, Madison Square Garden, the Marina City Towers in Chicago, and Toronto City Hall. As an associate he designed numerous structures including the Annenberg Tower of Mount Sinai Hospital, the University of Virginia Field House , the Hofstra University Bridge, and the Wesleyan University hockey rink. Mr. Berger was named as one of the top 3 structural engineers in the past 125 years, by Engineering News Record magazine (August 30,1999). In ENR's November 2003 issue, Mr. Berger was listed as one of the "World's Construction Leaders Top People," in the Structural Engineers category. Also, the August 2007 issue of Architectural Record listed Mr. Berger among the modern world's structural engineers who have contributed substantially to architecture. 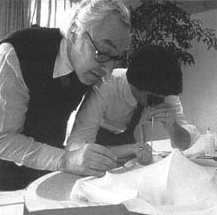 More information about Mr. Berger and fabric structures can be found in his book, Light Structures - Structures of Light: The Art and Engineering of Tensile Architecture Illustrated by the Work of Horst Berger , / Horst Berger; Authorhouse (June, 2005).